Join our Summer Reading Club (SRC) to supercharge your summer reading. Children and young people ages 3 to 18 can all join our FREE Summer Reading Club. As you read, collect fun incentive prizes. NEW! This year you can register online and log reading through the Beanstack app. Collect virtual badges, stickers and receive reminders to head to the library to pick up other fun incentive prizes as you read. For every 10 books (10x 15minutes of reading) completed you will go in the draw to win one of our major prizes. Plus heaps of free events and activities! Register for SRC. If you are not already a member of the library you can join for free and then register. Start reading! Log each book read or log your reading in 15 minutes blocks. As you read, earn virtual badges and stickers. Receive notifications when it is time to visit the library and pick up a small incentive prize. Participate in the SRC activities at your preferred branch/s throughout summer. Online - sign up through our website portal, then download the Beanstack app and start logging each book read. You can register as an individual or a family. Pssst..You can download the Beanstack app at any time during the Summer Reading Club if you decide you would like to try going paper free! In the Reading Log sheet,opens a new window there is space to write the names of the books you read. 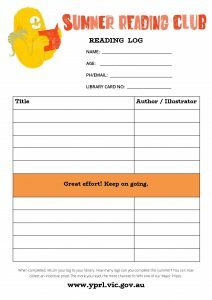 When your Reading Log is full, return it to the library, grab a new sheet and keep reading. Drop into the library to claim stickers, pencil toppers, wristbands, keyrings and other fun prizes. 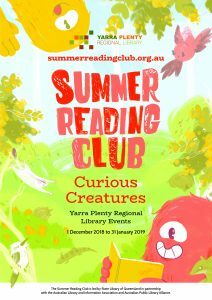 Although the Summer Reading Club is open to those aged 3-18 years old. We understand that those 12+ may not have the same interests as the younger ones. So, we have created some mini competitionsopens a new window just for you. There is a six-word story competition, book review competition and a twitter bio of your favourite fictional character competition. You can read magazines, comics, poetry, novels, newspapers, diaries, reference materials, cookbooks, atlases, maps, audiobooks, short story collections - almost anything you can think of. You can even listen to a book. We have free eAudiobooks you can downloadopens a new window. If you're stuck for ideas, check out some of our recommended reading book lists. Can children read with a grown-up? Yes! It’s great to read with grown-ups. If children are not yet independent readers, adults can read to them. Please return your Reading Records by 31 January 2018. Prizes will be drawn and winners advised by Wednesday 13 February 2018. You can pick up your child's SRC certificate in your local branch throughout February. Plus Latitude tickets, Australian Geographic Store vouchers, audiobooks, incentive prizes and much more! Read, play, discover, and write your way through the curiosities of the creature world.